Murray Hill is at the forefront of dental implant technology, as we now offer both dental implant restoration and placement! 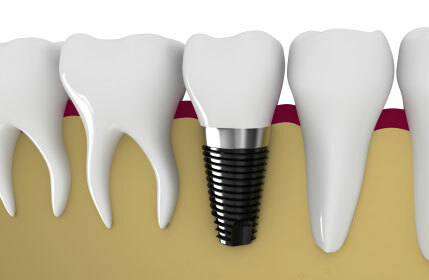 Gone are the costly, inconvenient days where you have to visit an implant specialist to have them placed. Dental implants offer a permanent option for replacing missing teeth. They act as replacement tooth roots, providing the foundation necessary to affix replacement teeth. The dental implant process begins with a small metal post inserted into the jawbone, which acts as the strong base for the placement of a permanent or removable crown. While implants can last anywhere from 10-15 years, itâ€™s important to follow a proper dental hygiene regimen to help them last as long as possible. Dental implant restoration reinstates patient confidence by repairing a broken or missing crown from an existing implant. Implant restoration is a two-stage process, beginning with your replacement tooth root being implanted. Once the tooth root replacement is completely healed, youâ€™ll visit us again, and weâ€™ll fit you for a custom-designed crown that will be placed over the implant. As with all dental conditions, each patientâ€™s situation will be determined on a personal basis. In some dental implant restoration cases, we have the opportunity to use our advanced CEREC crown machine, which designs same day crowns that we can fit and place in the same day! Contact us today about dental implant placement and/or restoration. We are happy to welcome new patients!